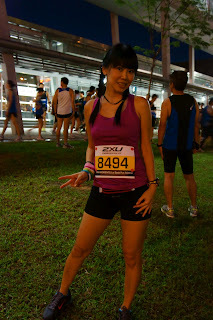 1st April 2012 2XU Compression Run. By coincident that was also April Fools' day. I was hoping it was a joke though because I was completely not ready for this run. I have been down for weeks due to viral flu and cough, only started getting back on the road just few days before the race. I was telling Asree about it that i am nervous but he encourages me to go slow and easy and forget about the timing. He managed to get a bib from Johan who cannot participate in the run and he called me up and said, "Don't worry, I will pace you. Just go for it !" Though I felt a little relief but butterflies still fluttering in my stomach. The night before the race was terrifying one for me. I told myself I have to eat well, and so I gobbled a big plate of pasta hoping that it will reserve the energy in my body for the run the next day. Finally the day was here. Asree and myself arrived 1 hour before the start of the race. It was planned so that I can find a parking lot and most importantly to do some warm up and stretching. My nervousness did not go away and Asree could see it from my expression . He kept assuring me that it will be fine. At that moment I felt like vomitting, my mind was fuzzy, my stomach was making strange sounds and my legs were rubbery, it doesn't seem that those legs belong to me. I kept telling myself to be cool and calm, is just a run, no big deal. We met Halim BillieJoe at the tentage area where bags had to be deposited. It was still early I guess as the queue wasn't very long. 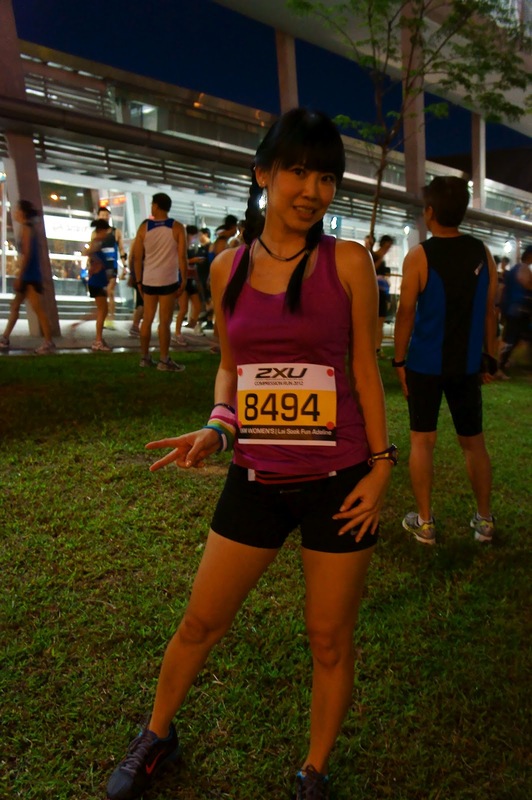 The crowd started pouring in around 6.30am and you can see lots of runners wearing the 2XU tees. Some of them were very well dressed in their running attire. Suddenly, I noticed there was this guy who is wearing a golden wig which looks like a crown, walking past. All eyes were on him . I guess he wanted the attention and he was smiling with pride from the overwhelming onlookers. We started to warm up and getting ready to the start point. Streams of people also started moving along. "Body to body", you could smell all the awful BO from all these people. Even though it was an open area, I felt suffocated among them and I could hardly breathe because of the BO. The air was stale and still !! The DJ as usual was trying to create enthusiam for this event. Seriously, I was hoping that he could just cut the crap and get us going . Finally he announced that the race is gona start in 5 mins and a loud horn signalled the start of the race. Yes this is it !!! The first 5km was slow and steady. My enthusiam sets in and I told myself that I should be able to complete it in 1 hr 30 mins. After we past 7km , my calves started to hurts. I looked around and discovered many runners were already walking and catching their breath. It was a terrible mistake I made, to use VFF during training few days before the run. I should instead train with the pair of shoe that I will be using for the race. Nevertheless the pair of Nike Air Max with thick cushioning doesn't help much . My calves began to beg me not to go on. I tolerated and went very slowly . Every water point seem to be my saviour because this was the chance that I could rest my feet and at the same time to quench my thirst rather than to hydrate my body. I have to say that the logistics were well organised with many Pocari/water points along the route. The patience Asree had to keep pushing me all the way and reminding me that we are approaching the end soon was over-whelming. I was telling myself that there still another 5km more , how could we be reaching to the finishing line soon? The route was familar as I remembered the same route I did in 2011 for The Shape Run. It was scenic . Many runners just stopped to take photographs, I guess these are the people who wants to enjoy the journey but not caring about the results. Bravo !! In view of the excruciating pain on my calves and ankle, I had to stop 3 times along the way for medical assistance. The first aiders were so readily to help us when needed. As the last 1km was approaching, I should be feeling relief and happy but instead I felt lost. The finishing line was nearing and yet I felt lost? Can you believe it?! Maybe the pain was too overwhelming that I cannot even think or react properly. At long last, I reached the finish line and proceeded to collect the most talked about medal. I noticed that I had completed the run in 2hours 14 mins 39 sec. I was disappointed as i know the timing was indeed bad. However the consoling part was that I have completed the race despite much suffering and a friend pacing me with so much encouragement; "A friend in need, is a friend indeed". Truely with the FREEDOM FREAKS' motto, they will "Leave no one behind". Last but not least, all the FF members that took part in the run gathered and took our most memorable photos together before we dismissed from the scene.